The location of this holiday home is fantastic. Right in the heart of Riverton rocks it has fabulous uninterrupted views and is a nice low maintenance stay. It is a short stroll to the beach where you can swim or surf and then come back and warm up in the outside shower. Or you can drive to nearby Mores reserve for a short bush walk or visit the Te Hikoi museum. Riverton is a thirty minute drive to Invercargill or you can carry on and explore the Southern scenic route. This home has modern facilities and was renovated within the last eight years. Everything is light and bright and catches the sun all day long. Two heatpumps will keep you warm in winter and there are books/games to keep you entertained. A very relaxing and welcoming home which we can guarantee you will enjoy the many comforts of a home away from home. This property is BYO linen & self cleaning. 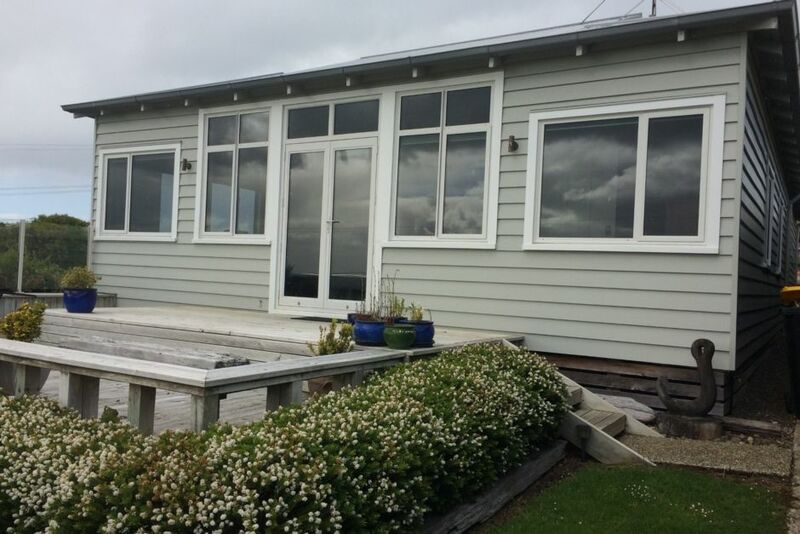 We are a farming family from Northern Southland who have strong family ties to the Riverton area and enjoy our holiday home at the beach. We are happy to share this fabulous spot with others and guarantee that you will enjoy your stay in this spot of paradise. Such a quick stroll to the beach !!! Only a 2 minute walk to the bar/restaurant and about a 600m walk to local dairy, takeaways and playground. A great location. A nice compact bathroom with a shower with good pressure over the bath. There is also an outside shower available. Only a quick 50 meter stroll and you are at Riverton beach which is a fabulous safe swimming beach and depending on the weather can be great for surfing or paddle boarding. Enjoy beautiful views of the Riverton beach from the house on Ivy Street which is located one block back from the beach. Fabulous ocean views. Relax on the deck and watch the fishing boats come and go. Lovely compact modern kitchen with a full set of cooking facilities. Dining table that seats 4 but also 3 bar stools and hopefully the weather is nice so you can sit outside. Great base and location. Comfort and quality this accommodation worked well for our stay in Riverton. We would stay again and recommend to others. Great views and location Enjoyed the deck with wine and fresh seafood. Enjoyed the deck with wine and fresh seafood. A beautiful property with outstanding views. A beautiful property with outstanding views. Very comfortable, a home away from home.